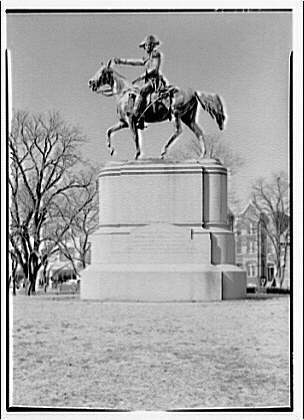 Revolutionary war hero Nathanael Greene was born on August 7, 1742, at Potowomut in Warwick, Rhode Island. Before the Revolution, Greene managed his father's iron foundries and is said to have served in the Rhode Island colonial legislature. Self-trained in military tactics and science, he was instrumental in the formation of a unit known as the Kentish Guards in October 1774, serving as a private until his commission in May 1775 as a brigadier general in the Rhode Island Army of Observation. In June of the same year he was commissioned with the same rank in the Continental army with command of troops during the siege of Boston in 1775 and 1776. After taking command of the troops on Long Island in 1776, he was commissioned by George Washington as major general in August 1776, but saw little action due to a severe illness. For the next four years, General Greene participated in the battles of Trenton and Princeton, endured the winter of 1777-78 at Valley Forge, and served as quartermaster general while continuing to serve in the field. 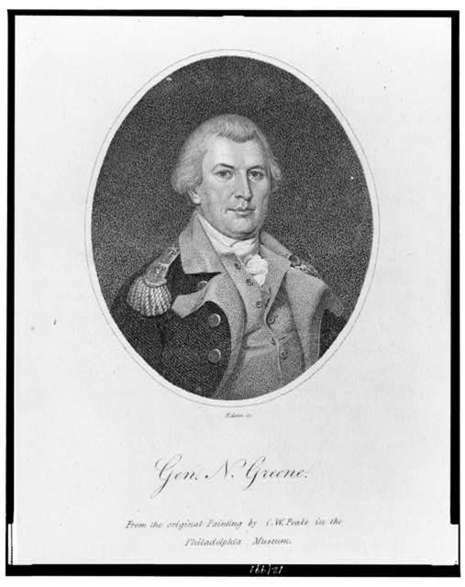 Prior to taking command of the southern campaign of 1780-82, General Greene was commander of West Point, replacing the disgraced Benedict Arnold. During this period, he presided over the trial and execution of Major John Andre. Nathanael Greene (August 7, 1742 – June 19, 1786) was a major general of the Continental Army in the American Revolutionary War. When the war began, Greene was a militia private, the lowest rank possible; he emerged from the war with a reputation as George Washington's most gifted and dependable officer. Many places in the United States are named for him. The son of a Quaker farmer and smith, also named Nathanael, he was born at Potowomut in the township of Warwick, Rhode Island, on July 27, 1742 (old style)/August 7, 1742 new style. His mother, Mary Mott, was his father's second wife. Though his father's sect discouraged "literary accomplishments," Greene educated himself, with a special study of mathematics, history of military tactics and law. The Rev. Ezra Stiles, later president of Yale University, was a strong influence in the young Nathanael's life. In 1770, Greene moved to Coventry, Rhode Island, to take charge of the family-owned forge (foundry), shortly prior to his father's death. There, he was the first to urge the establishment of a public school and in the same year he was chosen as a member of the Rhode Island General Assembly, to which he was re-elected in 1771, 1772 and 1775. It is debatable that he was a member of the General Assembly since there is no mention of his participation in his personal papers and because there were several of his contemporaries with the same name from Rhode Island. He sympathized strongly with the "Whig," or Patriot, element among the colonists. In 1774, he married Catherine Littlefield Greene of Block Island. "Caty," as she was known by friends, had been living in East Greenwich with her aunt and uncle (William and Catharine [Ray] Greene of Greene Farm, East Greenwich, R.I.) since her mother died when she was ten years old. Her uncle was a Whig Party leader and governor of Rhode Island. Her aunt and namesake, Catherine Ray, was a close friend and correspondent of Benjamin Franklin from 1751-1784.Nathanael Greene and Catherine Littlefield were married in the "best parlor" at Greene Farm, East Greenwich, R.I. where a framed invitation to their wedding hangs on the back wall to this day (2009).